The Group 7 elements are placed in the vertical column, second from the right-hand side of the periodic table. All Group 7 elements have 7 electrons in their outer shell. Fluorine, chlorine, bromine, iodine, and astatine, all belong to Group 7. Astatine (At), the last element in the Group does not occur naturally. It is a very unstable, radioactive element first synthesised in 1940 by chemist in the USA. Its most stable isotope 24085At has a half-life of 8.3 hours. The name Astatine is from the Greek word 'astatos' meaning unstable. 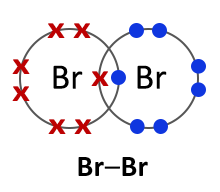 Group 7 elements form salts when they react with metals. The term 'halogen' means 'salt former', which is why Group 7 elements are called halogens. In general the halogens comprise the most reactive group of non-metals. The halogens are so reactive that they cannot exist free in nature. Halogens consist of diatomic molecules. This means they exist as molecules, each with a pair of atoms. 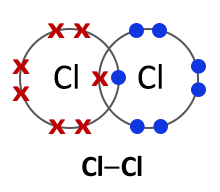 Chlorine molecules have the formula Cl2, bromine Br2 and iodine I2. 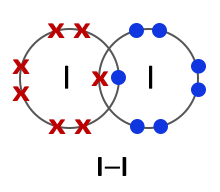 All halogens exist as diatomic molecules or in other words as two- atom molecules. The two atoms form a covalent bond by sharing two electrons between them.